What Car Expenses Can I Deduct for Business Driving? Business owners and employees who drive for business purposes can deduct expenses for the use of personal cars or company cars for business purposes. In both cases, the expenses must be documented (more on this below) and must specifically business-related to be deductible. Personal expenses and other non-business expenses that are described below are not allowable business driving expenses. Expenses for commuting back and forth to work are not deductible for business owners or employees. The IRS allows two different ways to deduct expenses for business driving: actual expenses and a standard mileage deduction. Which you choose depends on your situation and on IRS allowances and limitations. The standard IRS mileage deduction for business driving, which changes every year, is the easiest to use. You just multiply the business miles driven for the year by the rate for that year and use that amount on the appropriate tax form. Read more about the benefits, drawbacks, and limitations of the standard deduction versus actual expense deduction. Not included in the standard deduction are parking and tolls; you may deduct these expenses in addition to taking the standard deduction. There are some limitations on using standard versus actual expenses. If you start out using the standard method, you cannot usually switch to actual expenses. You must use the standard method with leased vehicles. You cannot use the standard method if your business has five or more cars, and if you take certain types of depreciation (see below). The expense of driving a car for business is a legitimate business expense, and you can deduct these expenses on your business tax return. How you record the deduction for your business depends on your business type and the type of tax return your business files. Most small business owners use Schedule C to report business profits and losses. Some employers reimburse employees for the cost of driving, while others do not. If your employee driving expenses are reimbursed, you can't deduct them as an expense on your personal tax return. You can't get a tax deduction for an expense your employer paid you for. Employees who drive for business purposes can deduct the non-reimbursed cost of business driving under the following circumstances. To get the deduction, you must be able to prove you have paid these expenses if you want to use the actual mileage rate, or prove the miles driven, if you want to use the standard mileage rate. Employee deductions for business driving are recorded on the personal tax return, along with other allowable business expenses, on Form 2106. Complete, showing all information including the date, location, mileage, actual expense, and business purpose. Accurate, meaning you should have backups for individual expenses. Timely, at the time of the expense, not created later. Read more about how to create excellent records for business driving expense deductions. If you use the standard deduction, you cannot deduct depreciation on the vehicle. Special rules apply if you use your car 50% or less for business purposes. Depreciation and car expenses is a complicated subject, so be sure to check with your tax advisor before you make any decisions on which deduction method to use. For personal use of the car: You must separate business and personal use of the car, whether it is your personal car or a business-owned car. Personal expenses are never deductible. For commuting expenses (going back and forth to work from home). Use of the car to transport business material while commuting, or to make business phone calls on your cell phone. 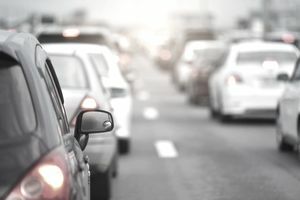 The IRS says these circumstances still don't make the expenses deductible because you are using the car primarily for commuting. Putting display material that advertises your business on your car doesn't qualify as business driving. Only specific business use of the car can be deducted. Daily driving costs between your home and temporary work sites in your metropolitan area. Driving expenses between your home (not your home office) and a second job, on your day off from your primary job.